Smart and Simple Playard - Ridgedale is rated 4.0 out of 5 by 2. From playtime to naptime, the Smart and Simple Playard™ from Ingenuity is a safe space for everything your baby needs. Rest in the DreamCentre, relax in the playard, and get cleaned up on the changing table. The DreamCentre is the perfect place to snooze thanks to soft fabrics and cool, breathable mesh. During play time, the transparent mesh panels make sure your baby stays in sight. The elevated changing table makes diaper changes more comfortable for both you and baby, and it flips easily out of the way when not in use. Designed to keep everything you need in one place, there are side storage pockets to keep necessities within reach. This playard easily folds when it’s time to pack up. You can quickly collapse and go without removing the bassinet. 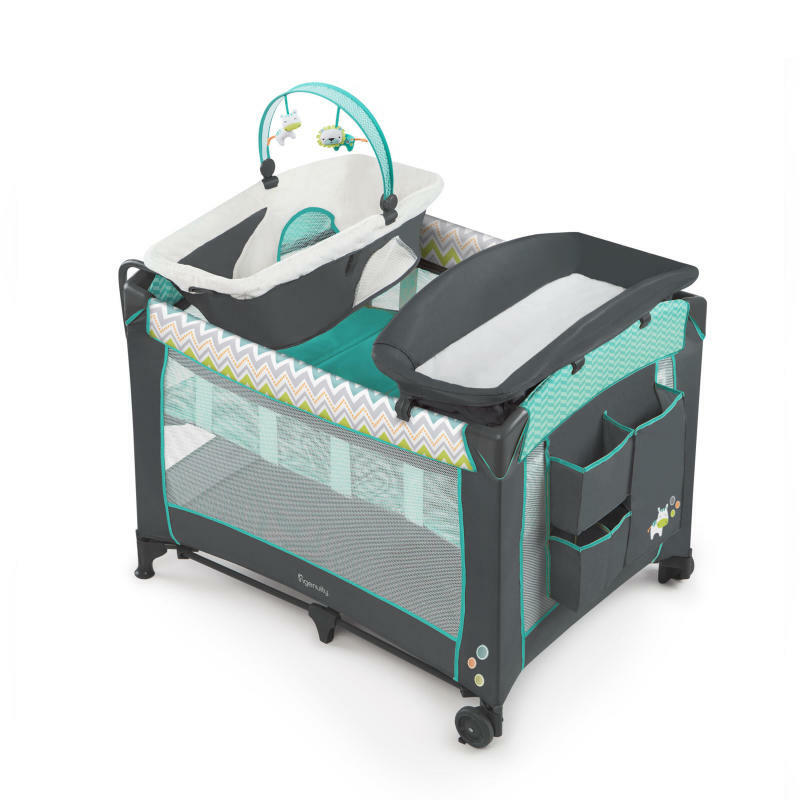 Wheels help move the Playard from room to room, and there’s a travel bag included for longer transports. When you need some hands-free moments, you can rely on the Smart and Simple Playard to hold your baby safe and close. Bring wherever you go – foldable and on wheels! Select fabric pieces are machine-washable. Wipe parts clean. Rated 3 out of 5 by Gabby from No This is a pretty good pack and play however the liner zipper broke as we were assembling it and we couldn't find replacement parts any where online and we also took the piece to the dry cleaners with hopes the could fix it but they can't neither so we can't use it until our baby is older I suppose he's only 5 weeks so it's kinda just a waste. Hopefully we can find a replacement piece soon so we can enjoy it. Rated 5 out of 5 by Savy1325 from Great Pack N Play My mom bought this a little over 2 years ago for my niece when my sister and her baby moved in with her. We all loved that it is gender neutral and still super cute. My niece only lived with my mom for 9 months but it was heavily used those 9 months. The changing table attachment was our best friend. The infant sleeper didn't work to great for us because it's slightly angled downward and my niece slid to the bottom. But she loved sleeping in the main compartment on the highest setting until she could pull up and we had to move it down to the lower setting. I am getting it as a hand me down now for my baby due in March and couldn't be more excited. I saw a few reviews saying it broke or fell apart but I couldn't disagree more. 9 months of heavy use and it is still good as new and easy to assemble. I just reassembled it from storage. Though it was not frequently washed with us because we hardly used the infant sleeper and the other parts are pretty much wipe clean and we always threw down a liner when changing her.